Startup Scaleup 2017 is guaranteed to provide countless learning and networking opportunities. It’s going to be a jam-packed day and we don’t want you don’t miss a thing! That’s why this year, we’ve built a handy Startup Scaleup app! Once you’ve signed up within the app, you’ll not only be able to see who else is attending–you’ll also be able to engage with them through the main activity stream, or through private messaging. 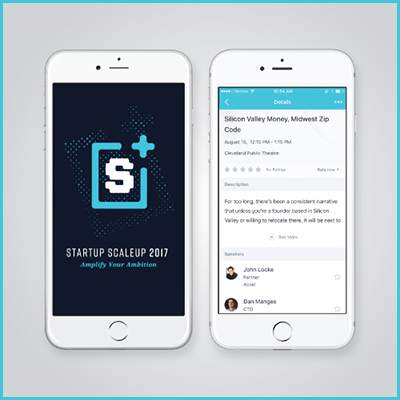 With the Startup Scaleup app, you’ll be able to favorite the sessions and speakers you find most valuable. Once you favorite a session, you’ll be able to set a 10 minute, 30 minute or 60 minute alert to be reminded that the session will be starting soon. Remember, favoriting a session does not guarantee a seat, as we do not offer reserved seating. Seating is on a first-come, first-served basis, so we strongly encourage you to arrive early to the sessions you don’t want to miss. Use the in-app Activity Stream to ask questions and engage with panelists and session speakers. Just start a new post within the stream, ask your question and tag the speaker using “@” and their name. All of the day’s sessions will be located within a .3 mile stretch along Detroit Avenue. But just to make sure you stay on the right track, we’ve included an in-app interactive map for seamless navigation. Prior to Startup Scaleup, we will be sending important event information and reminders through the app. On event day, we’ll also send push notifications to alert you to session start times, warn you when popular session are close to reaching capacity and more. We want to hear from you! In the activity stream, share your thoughts and photos with all event attendees using. What you share in the activity stream can be posted simultaneously to social platforms that you connect to the app. Don’t forget to include #StartupScaleup!